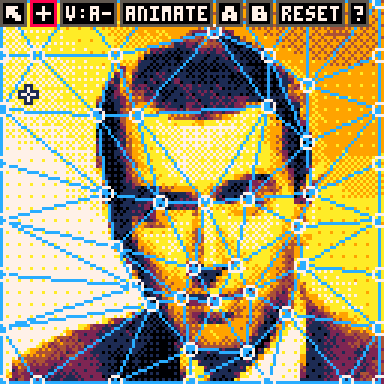 Use your personal Pico-8 computer to create professional-quality image morphing effects as seen in blockbusters such as "Willow" and "Terminator 2". Use the power of Pico Image Moprh 2000 to seamlessly transform one person into another or even change a cat into a dog! Pico Image Morph 2000 can even be used to create wacky deformations! The possibilities are endless! Pico Image Morph 2000 requires the use of the Pico Mouse Accessory. While in "Position Mode", locate deform points along critical portions of the image, such as centers of eyes or the edges of lips. 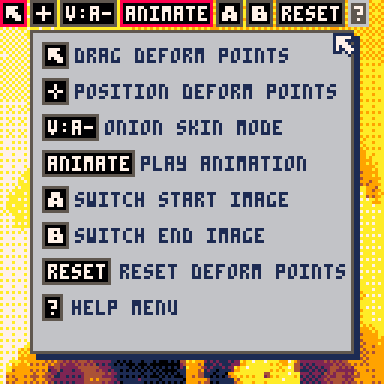 Switch to "Deform Mode" to drag deform points to new locations. Use the "Onion Skin" button to switch between viewing the Start Image, Target Image, or a blended overlay of both. The system include 5 different image to morph between. Morphing is done by using affine triangle transformations, and blending control point and texture coordinate positions for a source and a destination image and then compositing them together. This is a naive way to morph images, but at this resolution it actually works pretty well. Images are store in strings within the code--they are simply 64X64 16 level grayscale images. I can share the python script if anyone wants it. Mine your way to fame and fortune in a continuously generated 3D voxel world. But keep an eye on your energy level and make sure you can find your way back through the deep and twisted caves. Build block fortresses with a variety of materials. Use the Far-View 3D Map and GPS to stay safe. The mouse is required for mining and building. Click on shop computer to enter store menu. Ore and gems will auto-sell. With laser selected, click and hold on a block to mine it. Circular progress bar will indicate how long is left. Precious ores will take longer to mine. With a placeable block selected, click on the side of an existing block to place a new block. Energy will deplete when moving, jumping or mining. The battery can be recharged by standing on the glowing yellow charge squares near the shop. When your energy goes to zero, you will lose most of your money and be teleported back to the starting point. The GPS or Far View are good investments early on because it's easy to get lost. Be very careful about falling into caves. They may go very deep and getting back home before energy runs out could prove a challenge. 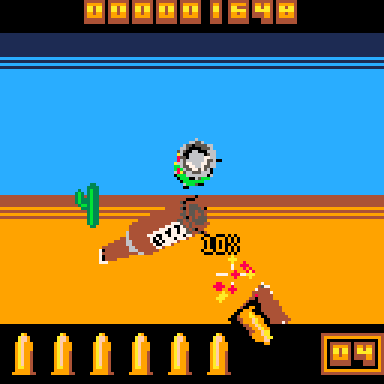 This game uses a modified ray-casting engine based on tutorials from (https://lodev.org/cgtutor/raycasting.html). This was extended to work with voxels, reading in a local 3-dimensional map array. 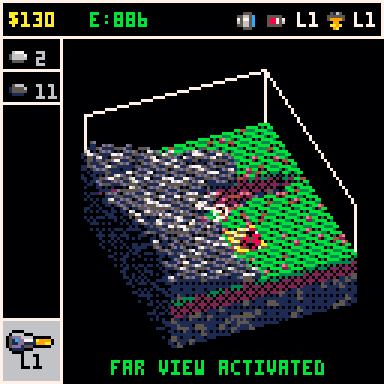 The map is generated dynamically as the player moves around. However, it is set up such that the same block will always exist at the same x,y,z coordinates. In addition, there is a user map that is used to store the locations of blocks that the user added or removed. These are essentially stored in a sparse matrix. There is currently no way to save your constructions. It might be possible to save some aspects of the world with the persistent cart data, but I don't know that 256 bytes will be sufficient. Clipboard import and export might be a better way to allow folks to share creations. The code is a dog's breakfast. Token count wasn't really a problem for me on this one, but it was a struggle to keep frame rate acceptable with the world rendering code. I'd love to be able to increase the view depth without dropping to 15 FPS. Take a stroll through the swirly bits of my imagination. --Scanned from a drawing and imported into Pico8. 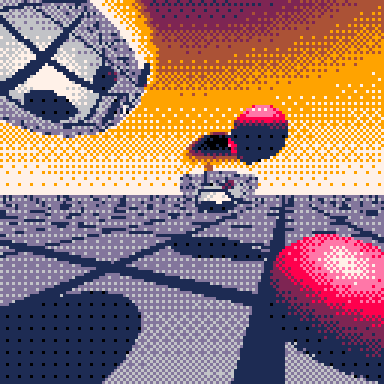 Here's a Pico-8 ray tracer with the amazing ability to render both spheres AND planes. Let it run all the way through even though the colors will be funky at first. After it renders the image, it will switch to high-color mode. These things always get stuck in my socks when I go hiking. I've been playing with a z-buffer 3D rendering implementation, which lends itself to recursive additive fractal structures. My ultimate plan was a static landscape renderer, but this was an interesting (if sluggish) detour. Here's a landscape / flight simulation engine that I have been playing with. I'm still figuring out how to turn this into a game, but at least it's functional now and runs at 30 fps. It takes a few seconds to generate the map using simplex noise mapped onto a sphere. Arrow keys to turn and pitch up and down. There's a 3D shaded polygon engine built into this as well, but I'm not using it yet. Playing around for the text jam using Signed Distance Functions. It's not really fast enough for anything other than a proof of concept for textifying grayscale images. 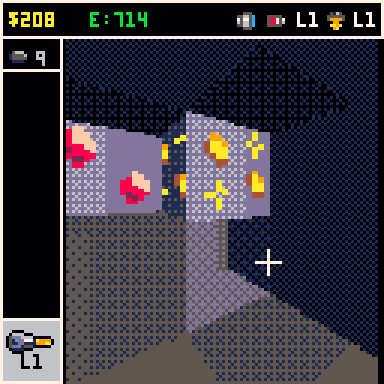 I've become unhealthily interested in image compression on Pico8. Hit the "z" key to see the next image. What we have here is something that might resemble the JPEG compression scheme if you squint. --Overall compresses to around 1/5 of original 8-bit grayscale size. Image quality is kinda low. 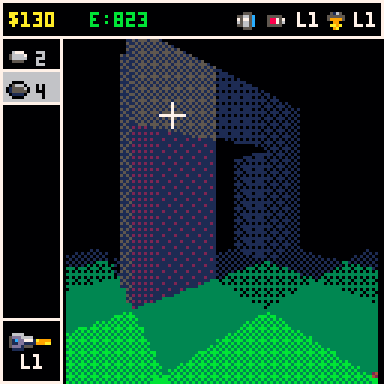 There are only about 16 levels of gray that are discernible on pico8 with dithering. Not sure that it makes a lot of sense to encode 256 shades of gray in that case. Not to mention that the image quality at 64x64 is pretty lame to begin with. This path may be a dead-end because I can only get about 12 64X64 images in here before hitting compressed code limit. If I drop the base 64 coding, I could fit maybe 10 images into the sprite area... Because Pico8 compresses data as well (definitely with better algorithms), my compression may be working at cross purposes to Zep's compression. I still need to do an experiment to see whether the base 64 encoding is any better than the base 16 coding. I've got some glitching in the bottom right blocks. Perhaps this will inspire someone to greater image compression heights :-D.
Step into cyberspace with cutting-edge 3D vector graphics. Battle tanks with your triangular pew-pew cannon. Explode into a number of polygons. This is an homage to Specter VR, which came packaged with my Macintosh Performa back in the day. Gameplay is a bit, well, simple. Basically drive around shooting and being shot at. I feel like I'm going around in circles here. Here's a demo effect kludged together from some doodles I had been playing with. Inspired by old-school demo-scene effects, here is a new and improved grayscale bump map render, which takes 8 bit height map input and generates real-time shading effects. Why settle for single renderings of a Mandelbrot when we can smoothly zoom in? The way this works is that we graphically zoom into initially rendered view of the Mandelbrot from the sprite buffer. While doing this, we are drawing the next level of Mandelbrot zoom into a second background buffer. When it's done, this gets copied into the zoom/sprite buffer. Lather, rinse, repeat. Overall, a neat effect I think. Though, I wonder if I should trade the (more or less) smooth frame rate and dithering for less chunky pixels. Also, I realize that I am awful at spelling "Mandelbrot". This is an attempt to create a faster falling sand simulation (60fps) by reading and writing directly to screen memory. All pixels / sand particles are active at all times. I was inspired by Helado's Tiny Terrarium and Axnjxn's Falling sand. I'm writing 1X2 pixel blocks in order to work directly with bytes and avoid bit-masking to address individual pixels. Then, I am using the display mode hack ( poke(0x5f2c, 2) ) to stretch the vertical scale of the display by 2X without requiring me to write any more data to screen memory. Here's a toy I have been playing around with. Perhaps somebody can use these functions for fancy shaded 3D rendering or something like that. 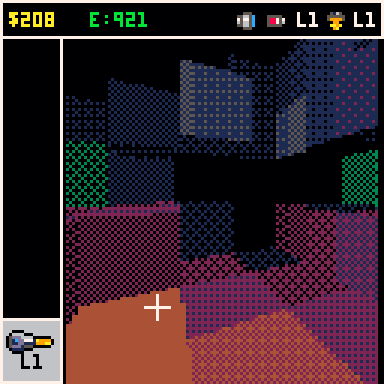 I have a few functions that draw "RGB" pixels to the screen using pattern dither that are approximated using the rgb values of the pico8 palette. fast_rgb_create() -- pre-renders patterns using a 4X4 bayer dither representing 8 levels of R and B and 16 levels of G.
Renders a triangle with the three corners colored at rgb and shades smoothly between them. Right now this uses the slower color_bayer_plot_8. If you move the cursor around with the arrow keys you can see the triangles. The vertices can be grabbed with the "z" key and the color of the vertices can be changed with the "x" key. Originally I had been thinking about making a gradient image compression algorithm, but it seemed less interesting after getting half-way through. Here's a spinning R G B triangle for fun. 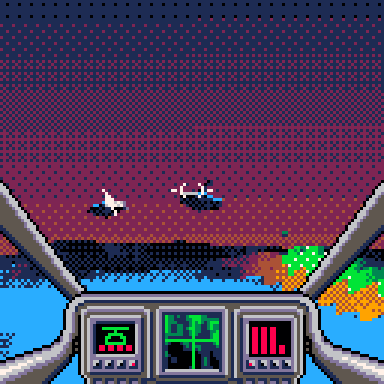 I've been playing around with Floyd–Steinberg dithering in order to achieve more continuous color gradients. This is slow as molasses of course, and even with optimization I don't think it could be used in a game. But perhaps it could be used in a ray tracer or other, more temporally relaxed image generation applications.